Decorative Paints struggled and profits slid, but AkzoNobel emerged from 2014 optimistic that its years-long restructuring process remained on track. The world's second-largest paint and coatings company is on course to meet its 2015 targets, despite a 25 percent year-over-year decline in profit (net income attributable to shareholders) for 2014, AkzoNobel announced Thursday (Feb. 12) in its fourth-quarter and full-year earnings report. 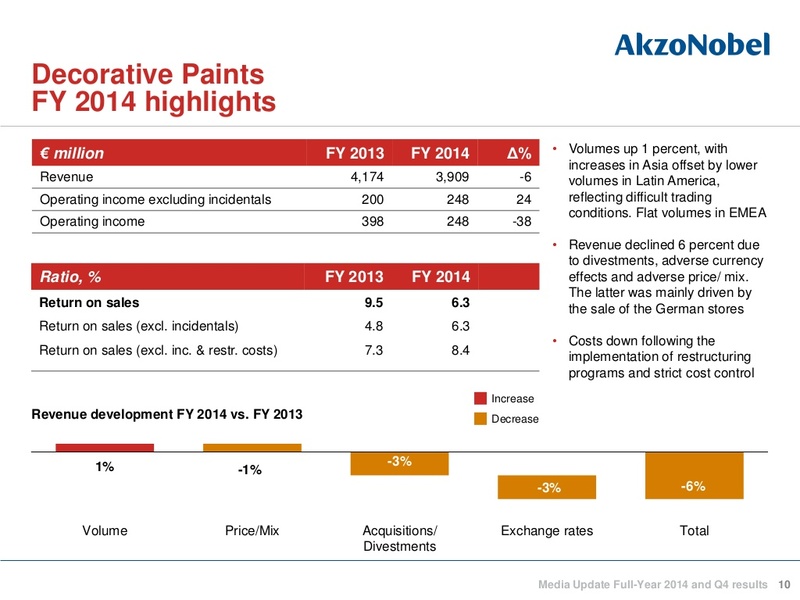 "2014 was challenging," but Akzo "continued to build a solid foundation," said CEO Ton Büchner. "2014 was challenging, evidenced by negative currency effects, a continued lack of growth in Europe, and a slowdown in some of the Asian and Latin American economies," said CEO Ton Büchner. But he also noted several corporate accomplishments, including Akzo's repeated sector leadership in the Dow Jones Sustainability Index, and said the company "continued to build a solid foundation" after several volatile years. Return on Sales (ROS) was 6.9 percent, including "negative incidental items," compared with 6.6 percent last year. The €85 million ($96.8 million) in negative incidentals included fraud in a U.S. subsidiary, project costs related to a diverstment, and other items. Despite the setbacks, the company said it remained on track to deliver its 2015 targets. Segment results were as follows. 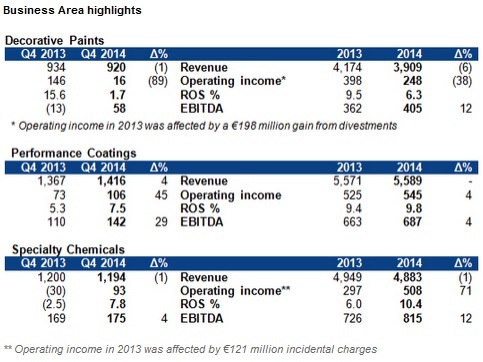 Full-year revenue was flat compared with the previous year, due to adverse currencies, AkzoNobel said. On the other hand, volumes were up 1 percent, mainly from growth in Marine and Protective Coatings and Powder Coatings. Restructuring activity continued, including implementation of a new organizational structure with fewer management layers. Restructuring savings exceeded costs, pushing up operating income by 4 percent to €545 million ($620.6 million USD) over 2013. Fourth-quarter revenue was also up 4 percent on the previous year, due to favorable currencies and price/mix. 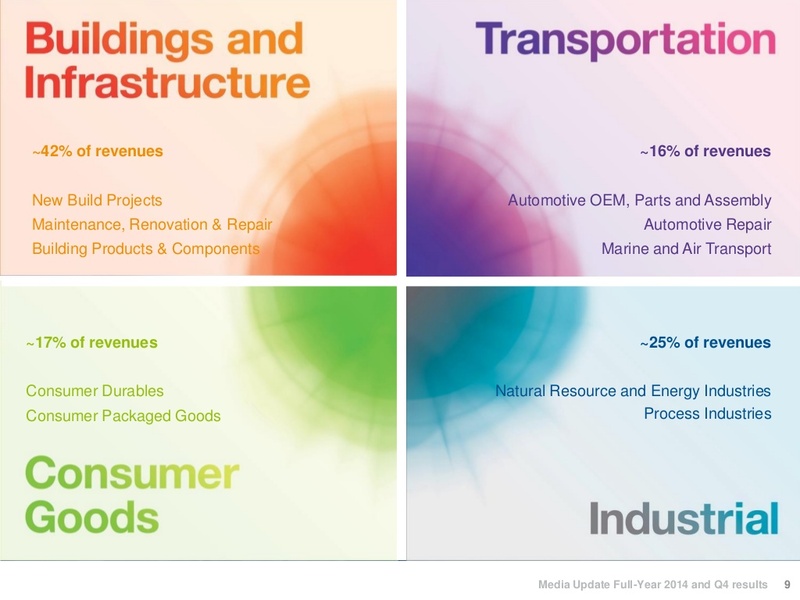 The quarter saw 4 percent revenue growth in Powder Coatings and 8 percent revenue growth in Marine and Protective. Restructuring costs were in line with 2013, while currencies and margin improvements improved Return on Sales by 7.5 percent year over year. Challenges continued in the architectural segment, with full-year revenue declining 6 percent despite a 1 percent increase in full-year sales volume. Q4 revenue dipped 1 percent, mainly due to the sale of the company's Germany stores. 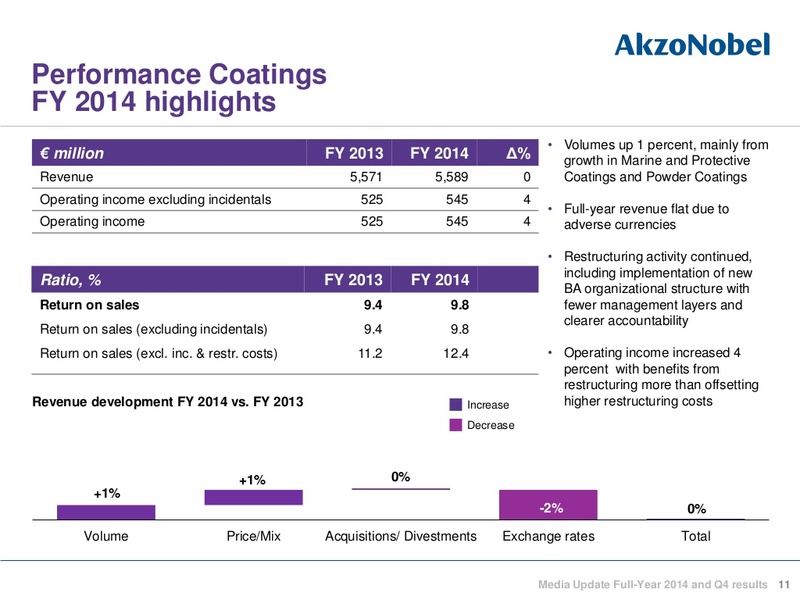 Overall, volumes were up in Asia, flat in Europe/EMEA, and down in Latin America, AkzoNobel said. 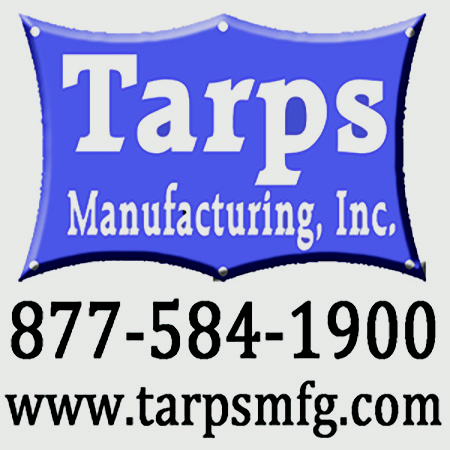 "Operational results clearly improved," the company added. 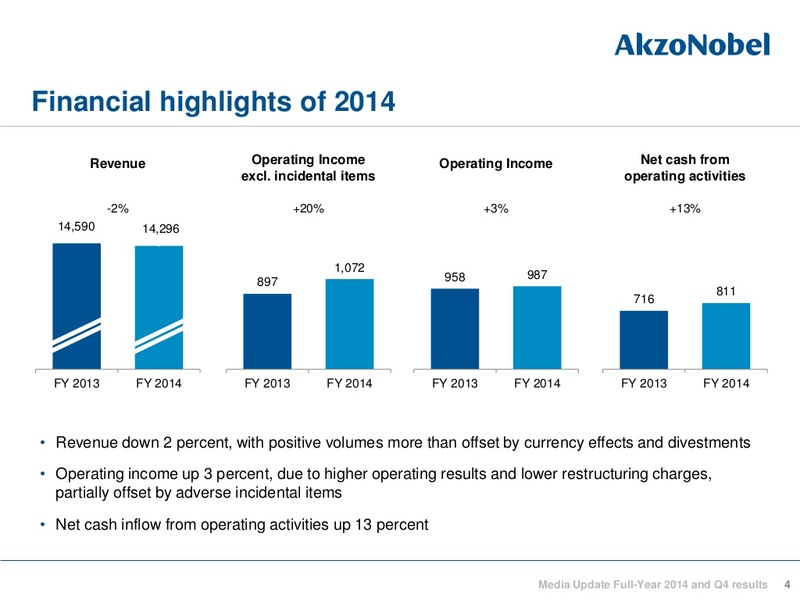 The segment increased profitability in 2014, with improved volumes and savings from restructuring, AkzoNobel said. Challenges included price pressure in caustic, economic and political uncertainty in Europe, and supply-chain issues in the Dutch company's home country. 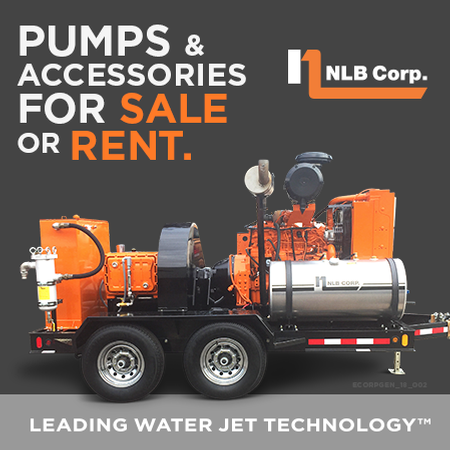 The company's financial fortunes in 2015 are largely in the hands of raw materials prices, exchange rates and "lower growth rates in high-growth economies," the company said. Büchner said 2014 had brought "further improvements in our operational performance, visible in our return on sales and return on investment levels." He added: "The introduction of several commercial excellence initiatives will help us drive organic growth going forward."